Department of Physics, Jamia Millia Islamia, New Delhi, India. Received November 14th, 2010; revised January 17th, 2011; accepted February 23rd, 2011. 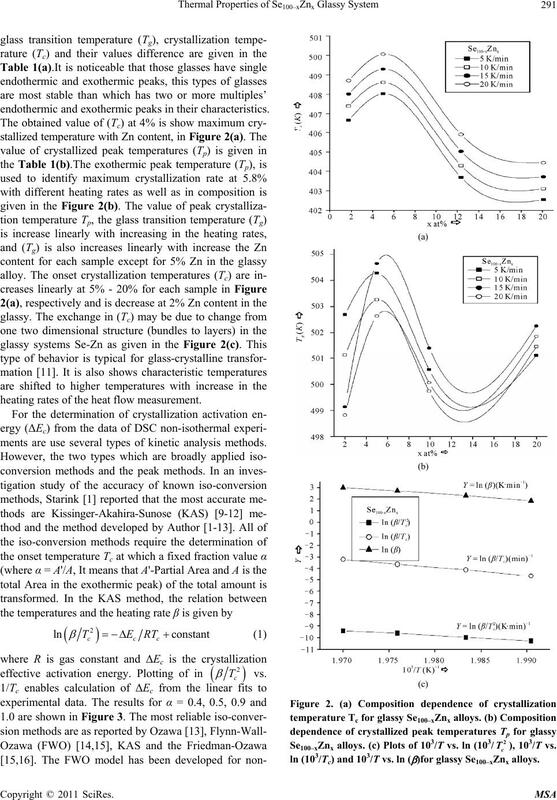 The crystallization process in Se100–xZnx glassy system is investigated using differential scanning calorimeters (DSC). chanism, thermal stability and the practical applica- tions. junction, they are very good electropositive elements. smaller aging effect as compared to pure a-Se. ~10 mg, before loading the (DSC) calorimeter. Figure 1. 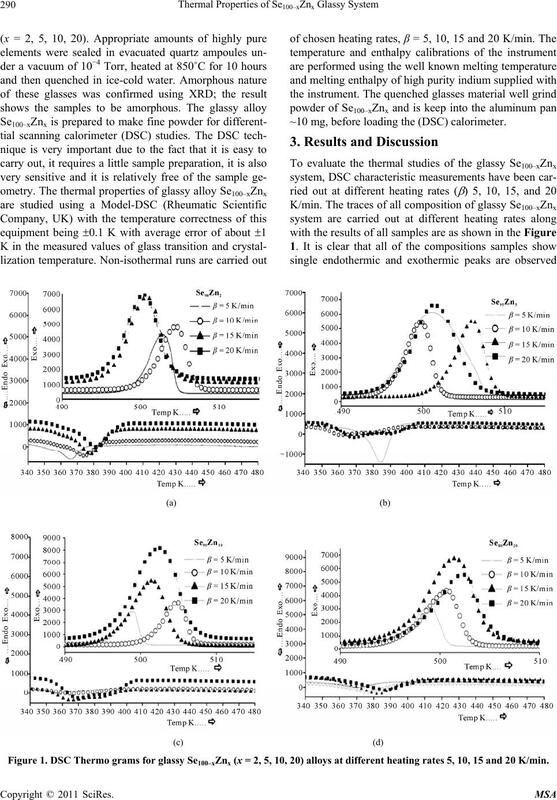 DSC Thermo grams for glassy Se100–xZnx (x = 2, 5, 10, 20) alloys at different heating rates 5, 10, 15 and 20 K/min. endothermic and exothermic peaks in their characteristics. heating rates of the heat flow measurement. ments are use several types of kinetic analysis methods. 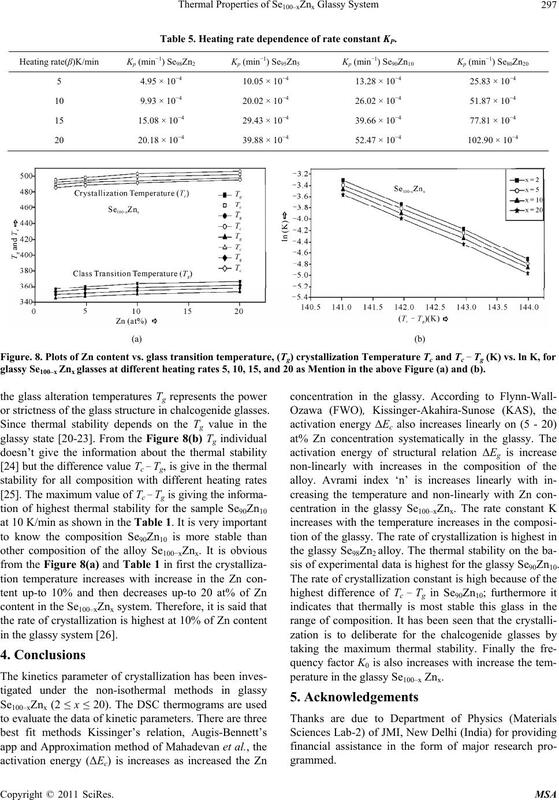 peak crystallization temperature Tp at different heating rates for glassy Se100–xZnx alloys. system doesn’t decrease with increases in the Zn content. (bundles to layers) in the Se-Zn system 5 at% Zn . (Zn-Zn) bonds, means reducing the bond concentration. as given in the Table 2, with the help of Equation (3). and 103/Tc vs. (β) for glassy Se100–xZnx alloys. with each other in the giving two. by using the methods Matusita-Ozawa and Vazquez. glass is supposed to have no nuclei (of critical size). Figure 4. 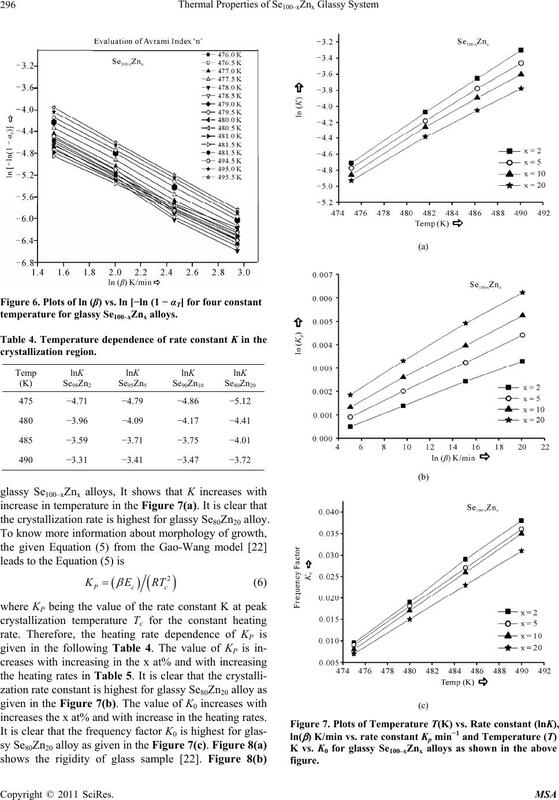 Plots of (103/T) vs. ln (β/T) at fix value of crystallized fraction α for glassy Se100–xZnx alloys. Se100- x Znx alloy evaluated by using non-isothermal methods. T) for glassy Se100–xZnx alloys. Table 3. Temperature dependence of Avrami index (n). temperature for glassy Se100–xZnx alloys. the crystallization rate is highest for glassy Se80Zn20 alloy. increases the x at% and with increase in the heating rates. Table 5. Heating rate dependence of rate constant KP. 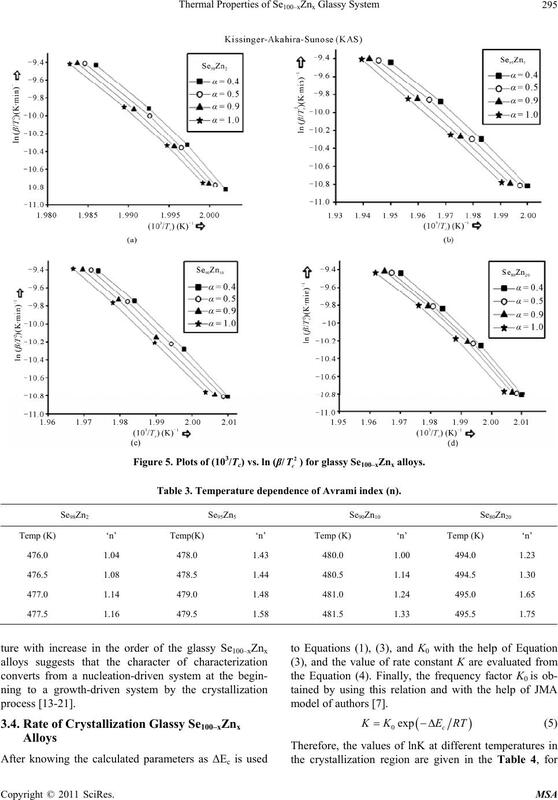 glassy Se100–x Znx glasses at different heating rates 5, 10, 15, and 20 as Mention in the above Figure (a) and (b). or strictness of the glass structure in chalcogenide glasses. in the glassy system . sis of experimental data is highest for the glassy Se90Zn10. 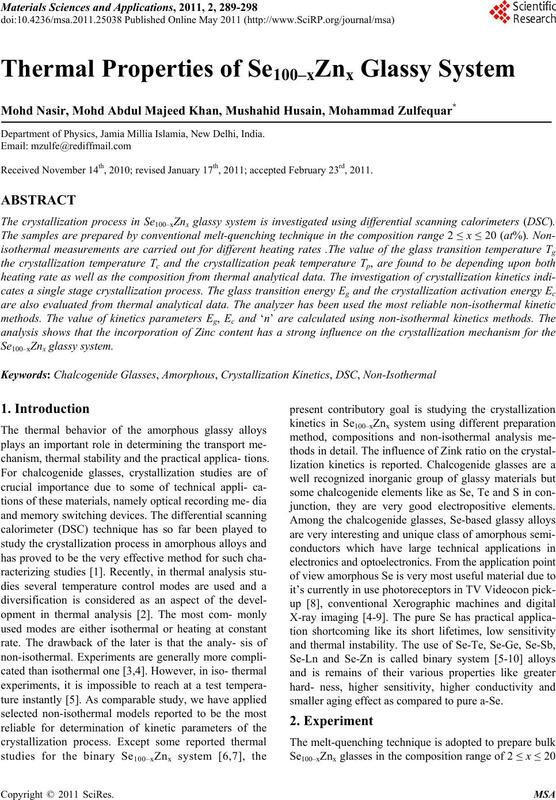 perature in the glassy Se100–x Znx. 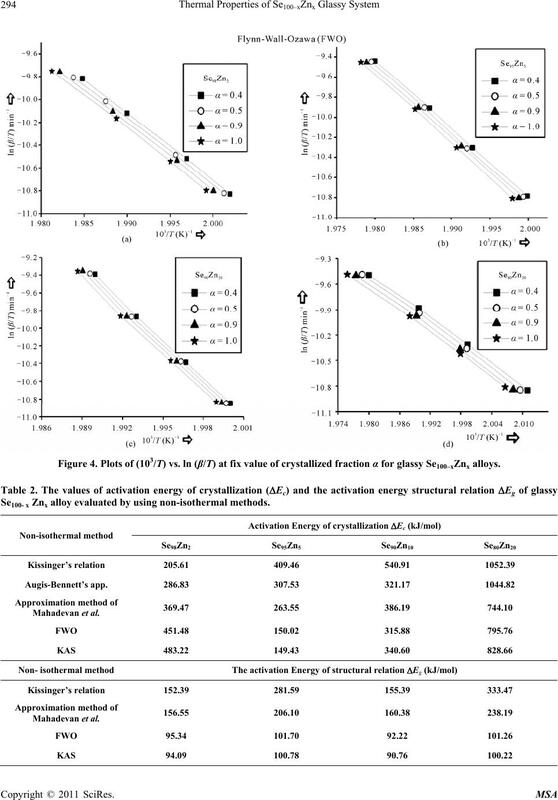 Reaction Kinetics,” International Materials Reviews, Vol. 49, No. 3-4, 2004, pp. 191-226.
tus Solidi (A), Vol. 203, No. 2, 2005, pp. 236-246. Physics, Vol. 29, No. 11, 2002, p. 2464.
nal of Physics, 29, 2005, pp. 193-200.
mal Analysis,” Analytical Chemistry, Vol. 29, 1957, pp. ing Materials, Marcel Dekker, New York, 1991, p. 355. Compounds, Vol. 486, No. 1-2, 2009, pp. 1-8. Technology, Chiba, Vol. 16, 1971. pp. 22-31. Vol. 38, No. 11, 1965, pp. 1881-1886. Polymer Letters, Vol. 4, No. 5, 1966, pp. 323-328. Polymer Symposia, Vol. 6, No. 1, 1964, pp. 183-185. Crystalline Solids, Vol. 248, No. 1, 1999, pp. 28-36. Transactions, Vol. 81, 1985, pp. 811-831. 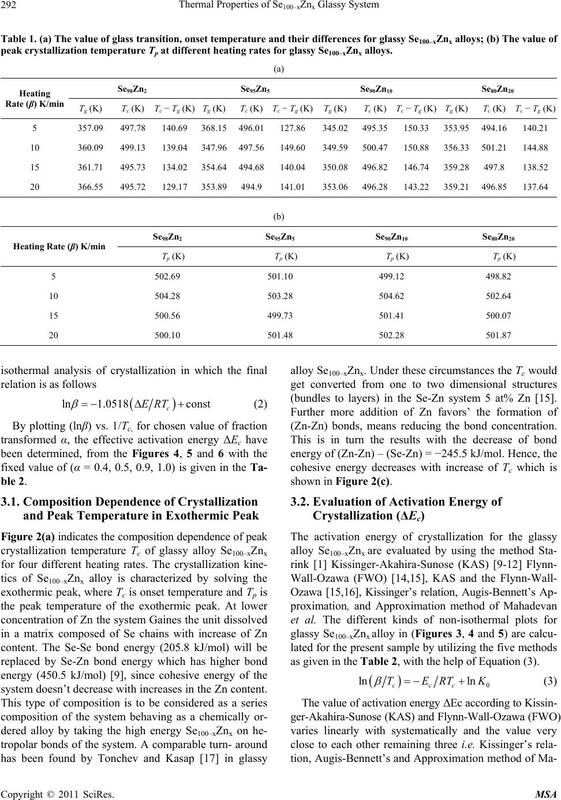 Techniques,” Journal of Non-Crystalline Solids, Vol. 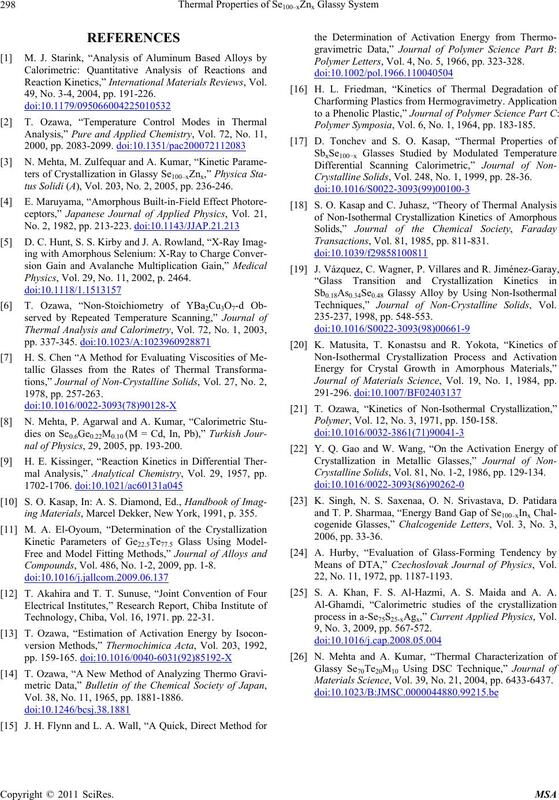 Journal of Materials Science, Vol. 19, No. 1, 1984, pp. Polymer , Vol. 12, No. 3, 1971, pp. 150-158. Crystalline Solids, Vol. 81, No. 1-2, 1986, pp. 129-134. Means of DTA,” Czechoslovak Journal of Physics, Vol. 22, No. 11, 1972, pp. 1187-1193. S. A. Khan, F. S. Al-Hazmi, A. S. Maida and A. 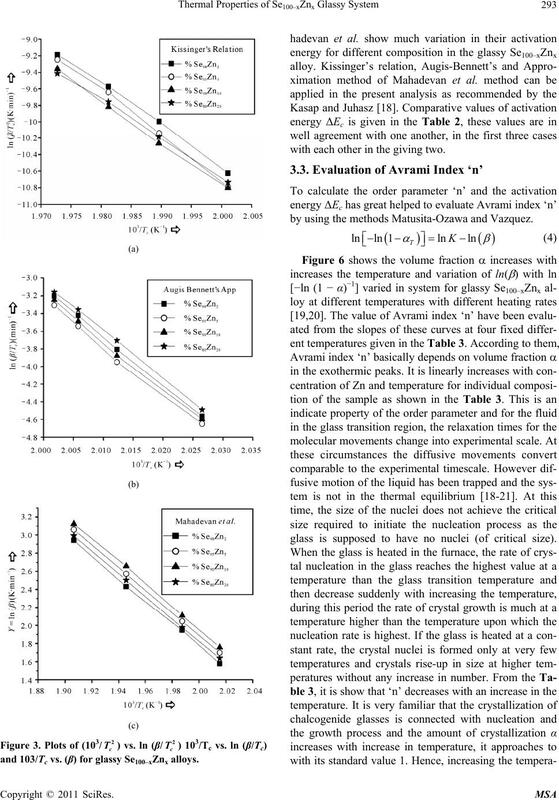 A.
process in a-Se75S25-xAgx,” Current Applied Physics, Vol. 9, No. 3, 2009, pp. 567-572. Materials Science, Vol. 39, No. 21, 2004, pp. 6433-6437.